Here it is; the first post as Happy Food Ninja. Because today is Mother’s Day I have decided to make this first post the all important OATMEAL! I can feel the excitement. My mom came to stay with us when Wolfie was born and opened the world of oatmeal to me again. I had been eating oatmeal, but apparently I was eating it all wrong! I had been focusing on only the flavor instead of the all important texture. The texture makes such a difference in this basic dish. To achieve the correct texture you must heat the liquid before adding the oats. Today we are starting with a recipe for Almond Apricot Oatmeal, then a brief discussion on how to make delicious oatmeal without a recipe. We will also go over how to create your own fabulous oatmeal flavors. Reduce heat to medium and stir in the oats and almond extract. Cook over medium heat until the water is absorbed, about 5 minutes. Scoop oatmeal into a bowl, stir in butter and syrup to your taste, and top with almonds. This makes one serving. What is important for successful oatmeal? Heating the liquid to boiling before stirring in the oats. The rest is up to you. 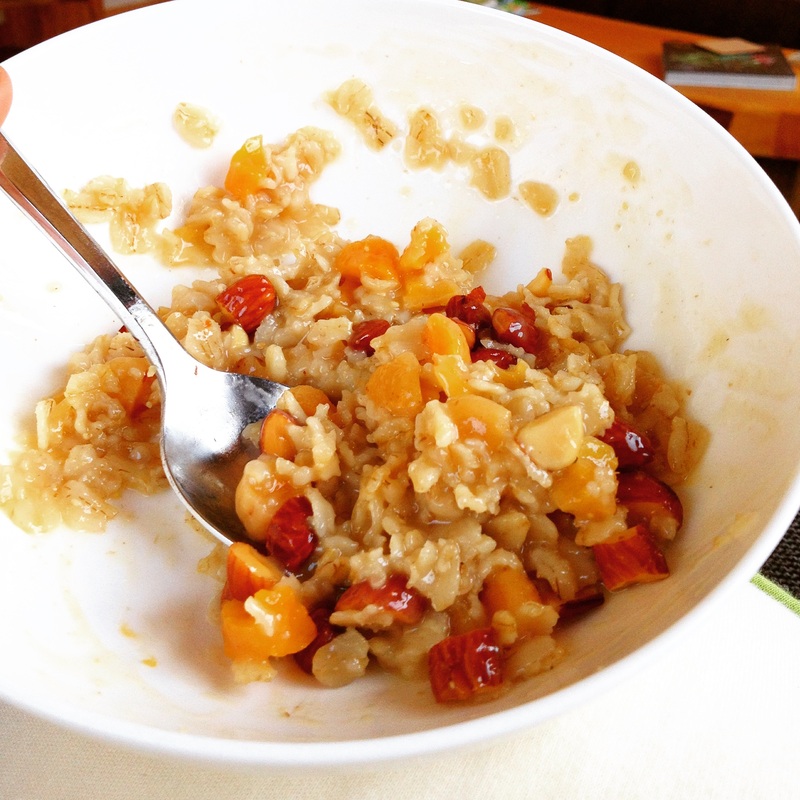 You could make a sweet oatmeal like the recipe in this post, or a savory oatmeal like this recipe. Oatmeal is a bit like rice, in that it has a basic flavor of its own, but takes to other ingredients, and the flavor changes drastically depending on what you add. You could use any edible liquid as a base. I have used water, milk, tea, vegetable broth, juice, and combinations of those. You then add flavoring. Flavoring consists of extracts and spices. Finish the pot with your add-ins like fruit and nuts. I got the idea from eating my car snack of almonds and apricots. A delicious combination for a snack. I happened to be thinking about breakfast while snacking (pretty common in my world to be thinking of my next meal while eating the current meal), that is where the idea started. The next morning I made my oats with apricots, and did a taste before adding sweetener and the almonds. I thought it needed a bit of something extra. I added almond extract to heighten the baked-good quality of the oats. I then added butter, maple syrup, and finished it with roasted, salted almonds. The whole dish brings me back to a scone I once had. That’s it. It started with an idea, and it grew bit by bit with me tasting along the way and adding things to develop the flavor I wanted. You can do the same with any flavor combination you can come up with. Your first layer of flavor. Milk. It will give you a creaminess, it will also start to add a touch of sweetness. If you are using a sweetened non-dairy milk like a vanilla soy milk it will be a very different, sweeter, oatmeal than if you used an unsweetened milk or water. Water will let the oats shine through. You will have a basic oatmeal base that you can easily flavor with other ingredients. Juice will start the sweetness and give a base of the flavor of the juice. Let’s say you use apple juice. You will have the start to apple oatmeal. You could then add apple pieces and cinnamon to make apple pie oatmeal. Vegetable broth. As in my oatmeal with kale and walnuts vegetable broth is the base for a great savory application. It starts shifting oatmeal from sweet to savory from the start. The oats will soak up the flavor from the broth and become something reminiscent of risotto. Adding a bit more flavor. Extracts such as vanilla or almond give a hint of those flavors. You could really mix it up here depending on what you have hanging around. A little mint mixed with cocoa powder for mint chocolate oatmeal, some almond as in this recipe to give the oats backbone. Spices. Ohh, now we are really getting into it. Remember that oatmeal can be sweet or savory. Frequently it is sweet and eaten for breakfast. A common spice to add is cinnamon. Easy and delicious. You could go crazy and try every spice in your cabinet one at a time. The would be a great way to get to know your spices, and the versatility of oatmeal:) If you are attempting to create oatmeal to mimic a recipe such as apple pie, look at that recipe and add those spices to your oatmeal. I like to add them at the same time as the oats. Other. I was trying to come up with an other category and all I could think of was cocoa powder. I love to add cocoa powder, peanut butter, and top with non-dairy milk. Ohh, so good. If you can think of something else to add to this category let me know! Adding texture and amping up the wow factor. Nuts and seeds. I feel nuts and seeds are an important part of oatmeal. I like the textural difference of the crunch they add. I use both whole nuts or seeds as well as nut and seed butters depending on the day. Nuts, seeds and butters also add some needed protein and healthy fats to keep you full. Almonds, walnuts, pecans, cashews, pumpkin seeds, sunflower seeds, I could go on. Just add them. Fruits and veggies. I frequently add fruit to my oatmeal, and every now and again will add a vegetable. My go-to is raisins, but the possibilities again seem endless. You can go fresh such as a little grated apple, or dried like the apricots here. Dates add sweetness and can be used to replace other sweetener like maple syrup in the finished product. Grated carrots for carrot cake oatmeal, apple for apple pie, raisins just because. Butter or oil. Well why wouldn’t you add butter, or your version of butter. Often Earth Balance Buttery Spread for me. Butter adds salt and a bit of richness that I think oatmeal needs. I will add this to most every oatmeal recipe I make. For some you could also use an oil. I would use coconut oil to help boost the coconut flavor in a coconut almond oatmeal, or olive oil for a savory base. Sweeteners. Most often your oatmeal is topped with something sweet like maple syrup or brown sugar. Both are awesome. Sometimes you don’t want to add sweetener for a variety of reasons. If you still want it sweet you could cook some chopped dates with the water and mashing them a bit before you add the oats. It will give a delightful natural sweetness. Also boosting the other flavors like the spices and extracts will reinforce flavor on your palate without the actual sugar. Milk and yogurt. This is yet another way to add dimension to your bowl of plain oats. The milk can add a coolness that will excite your palate and totally change your dish. Yogurt will do the same. Dairy or non-dairy versions are both good here. You can, of course, stir them in, but you could also leave them a little loose on top. When you do this, and get a spoonful of hot oats with the cool creaminess, your mouth will wake to the sensation. The cream will also add balance to a rich oatmeal like the chocolate peanut butter deliciousness. As I write this I feel I could go on and on, but I need to stop. Please comment with your favorite oatmeal combinations or ideas. Happy eating and Happy Mother’s Day!